Residential Rental Listing 3 bed 2 bath in Albuquerque, NM. Lovely Three Bedroom Single Story Home In Rio Rancho! lovely three bedroom single story home in rio rancho! North on Unser, West (left) on Cherry, South (left) on 17th Ave, Left on Tracy Ln, Right on Charles to home. 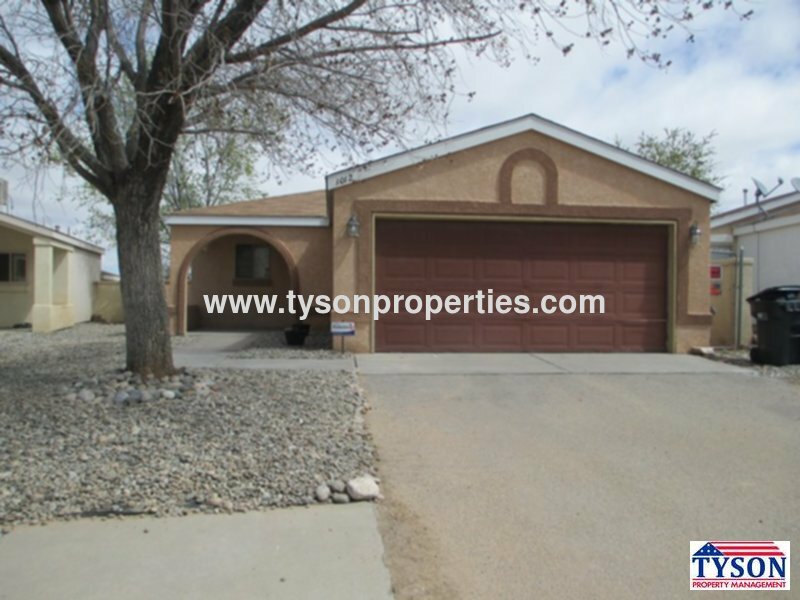 This lovely home in Norther Rio Rancho is located off Unser and Cherry near Canyon Park. This home has a unique layout as when you enter there is a greeting area and off to the left the kitchen is immediately available. This kitchen features black cabinetry and offers major appliances including a black french door refrigerator with ice maker, a gas stove, and a built in dishwasher. There are some steps down into the living area that connects to the backyard via glass sliding doors. There is no carpet throughout this home. There is onsite laundry available though washer and dryer units are not included. Throughout the rest of the home there are two guest bedrooms, a full guest bathroom, and a master bedroom. The Master Bedroom features an accent wall and mirrored closet doors. The exterior of this home offers a fenced and spacious backyard. The home also has a two car garage.